CG Police Job opening for all Indian eligible candidates who want to serve the Government of Chhattisgarh. CG is the short form of the “Chhattisgarh” state of India. Government of Chhattisgarh is looking for fresher candidates from India for filling up the various vacant positions in the Police department of CG State. 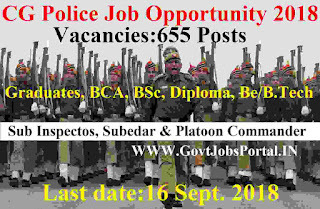 Police Recruitment department issued an official notification related to these CG Govt job for various job profiles including Subedar and Sub-Inspectors. This is an open recruitment process for all India to grab a CG Police job. CG Police department is going to filling up total 655 vacant positions through this recruitment procedure. We come to know about these CG Govt job through the Police department official website. Inside the official website of the Police department, they published a notification which contains the full information related to these CG police job. But the notification is in HINDI language only. So we are here sharing the information by translating that information into English language to make easy to understand to all the readers. Those who can understand HINDI easily can check that file link under IMPORTANT LINK section at the last of this article. All rights related to the information which we are going to share below with you readers goes to the CG Police department official website. More information related to these Government jobs in India under Police department is given below in this article. Read the whole article carefully before moving to online application related to these CG Govt jobs. The table below contains the full information related to these CG Police jobs including the Job Profile, Number of vacancies and pay scale which candidates will get after selecting for one of these CG police job profile. Check the table for more information. PAY BAND: Rs.35,400 Per Month (Pay Level-8) . The pay level is equivalent to all the job profile which we share above in the table. What are the various Admissibility Criteria for these CG Police jobs? Applicants who have a Graduation / Bachelor degree in any stream can apply for this CG Govt job. Those who have higher qualification than this can also apply for these Police jobs for Sub-Inspectors and Subedar. Having Graduation degree under B.Sc stream with Physics, Mathematics & Chemistry form known University. Those candidates are eligible who have BCA OR B.Sc. (Computer) degree. Having Degree(or) Diploma in one of the following trades: “Electrical/Electronics/Telecommunication Engineering” can apply. Age Bond: All Indian applicants can apply for these Government jobs under CG Police department whose age must be in between 18 years to 28 years. Those hoes age lies in between this figure can apply all of the above job profile. What are the various Physical Standards for these CG Police Jobs? What is the application fee for Applying these CG Govt jobs? You can pay the fee through “Debit Card, Credit Card, Net Banking”. What is the Procedure for Applying these Govt Jobs? Applicants who read the article carefully and now if you are satisfying all the conditions which we explained above in this article can apply for these CG Govt job online. The process for accepting the online application will be activated on 24th Sept. 2018 and the link will stay activated up to the date of 16th Sept. 2018. So all eligible candidates need to apply online between these dates. There is no other process for applying online. 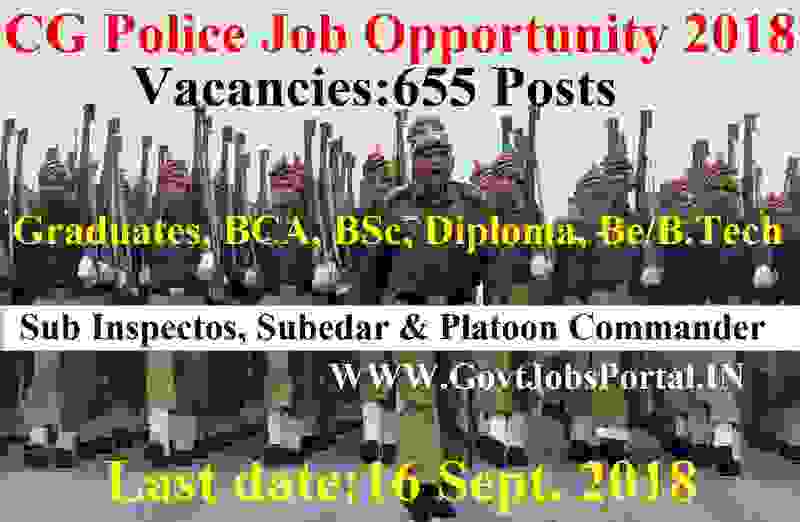 Check the IMPORTANT LINK section for more detail related to this CG police recruitment 2018. 24TH Aug. 2018 is the Starting Date to apply.